“Are we forgetting anything?” At least ten times I walk through the house for a final inspection and ask two of our children and a niece and nephew to check as well. 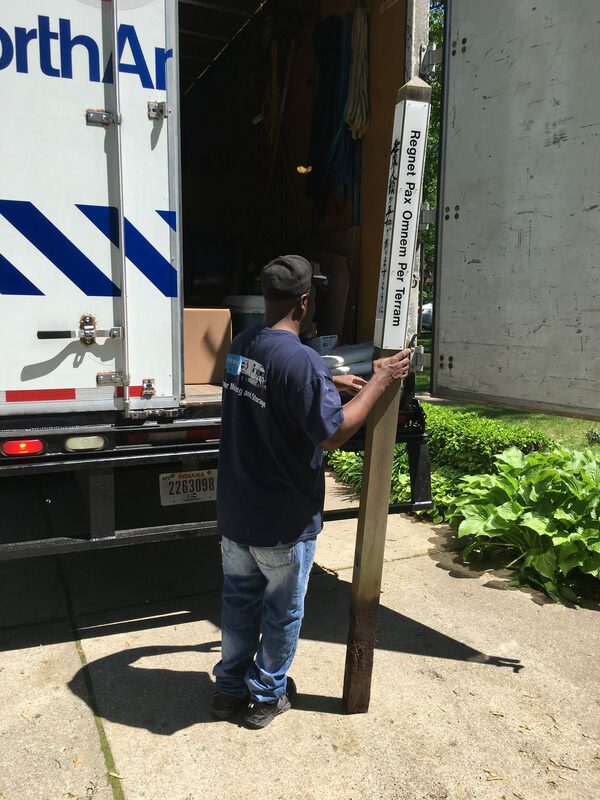 The workers are loading up the rest of our belongings to deliver them to the Des Moines area. Gary and I have begun the slow process of reuniting our two households after nine months of living apart. What I’ve missed is amazing! First, it’s a painting in the downstairs bathroom. Then it’s a bathmat in the shower upstairs and a tiny drawer filled with kitchen items. On my final obsessive walk-through, there sits the bathroom scales, in plain sight. Somehow, no one has seen it. There, in the front yard, stands the peace pole, our family’s witness to God’s desire for all living creatures in this world to experience the wholeness of shalom. The words are displayed on all four sides in Latin, Spanish, Japanese, and English. How could we have missed this intentional witness and sign of God’s hope for the world? “Don’t forget to take your peace with you,” God whispers in my ear. Do you take your peace with you wherever you go and offer it to everyone you meet? Stay in the city. Where would we be today if the disciples had bailed? How many times have you been tempted to leave, to give up on the church, or our country, or God? How often have you felt like admitting defeat, as if there were no more hope? Can you trust that God will clothe you, too, with the power from on high? Do you have faith that God will equip you with everything you need to witness to the grace of God as experienced on the day of Pentecost? Will you pay attention to needs of the world around you and acknowledge the burning in your heart and the movement of God in your life? The moving truck finally arrives in Iowa, and as we unload boxes from the truck to the house, I see two birds flying around the front porch. I also notice debris on the cement floor as well as high up on the stone alcove. “These birds couldn’t be building a nest, could they?” I ask Gary. 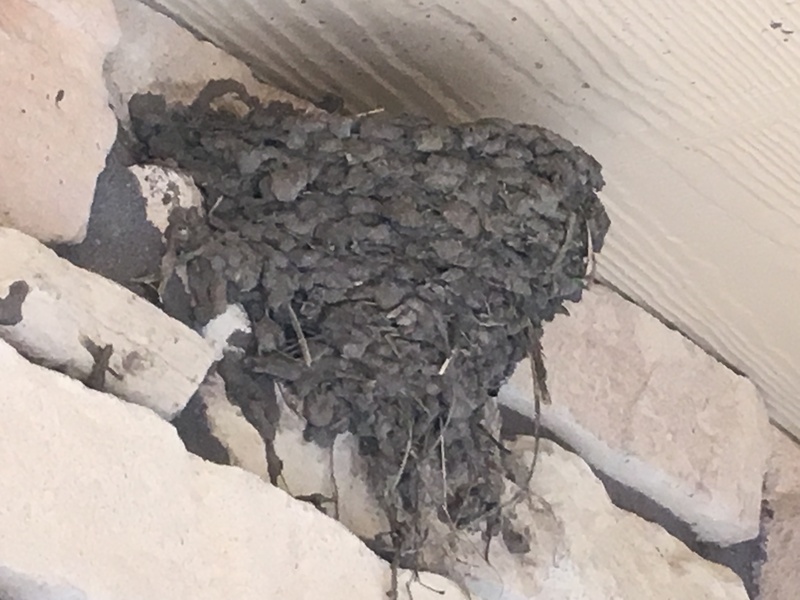 “There’s not enough room between the stones to create anything!” A week later, our barn swallow friends have constructed a small shelf out of mud and twigs, upon which sits a beautiful half cup-shaped nest. Each day the nest becomes more elaborate. It’s an engineering marvel. What I am learning about barn swallows is that they are very familiar birds in rural areas and semi-open country. 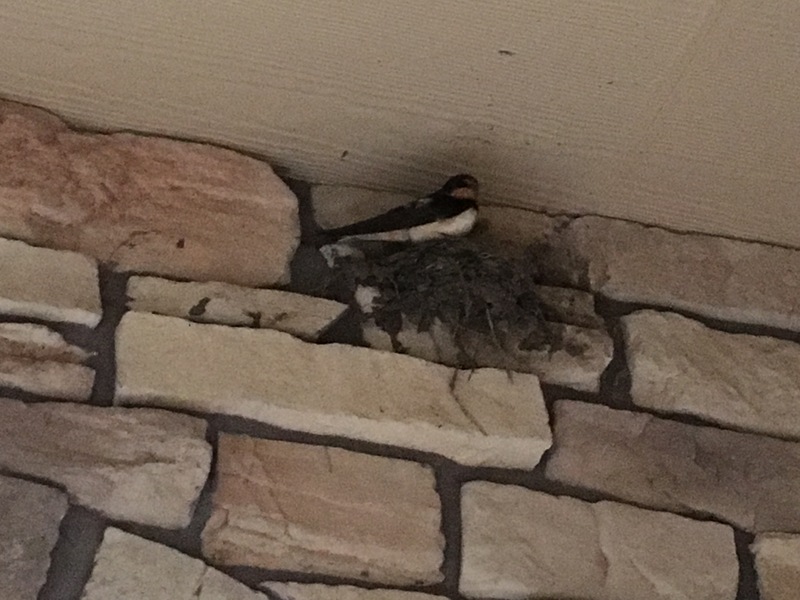 Barn swallows have also adopted humans as friends, typically nesting in barns, garages, under bridges and docks, or in the alcoves of porches like ours. In fact, most of their nesting sites are made by humans. Often both the female and male take turns incubating the eggs (typically 4-5). It’s not uncommon for one or two offspring from the pair’s previous broods to attend the nest and feed the baby birds, who usually leave the nest around 18-23 days after they are born. Day by day, as we wait with our barn swallows for their babies to be hatched, I have no doubt that they will “stay in the city,” which for them is the safety of our alcove. We’re in it with them. But what about you? How was God preparing you for the wind and fire of the Spirit to blow into your city or town yesterday on Pentecost Sunday? Did you pay attention to the signs? Were you inspired in the truest sense of the Latin word inspirare (God-breathed)? Were you even expecting the Spirit? How will your life be different? And with whom will you share the power? Pentecost has already come to our home, as our barn swallow friends teach us to pay attention to things like earth care, nature, sharing, simplicity, nesting, and taking turns. In this time when annual conferences are meeting across The United Methodist Church in the US, dare we stay in the city together? Can we proclaim in all the languages of the world, “May peace prevail on the earth?” Can we pay attention to who’s missing and search until we are reunited? Will we covenant to strengthen our mutual commitments and seek the welfare of all people on the earth? In the spirit of St. Francis, may we always look for beauty, care for the very least of God’s creatures, and find ways to serve and stay in the city until, together, we (including our barn swallows) are clothed with the power on high. Thanks be to God for peace poles, barn swallows, wind, and fire. Because the Iowa Annual Conference will be in session this weekend through Monday, June 12, the next Leading from the Heart will be published on Monday, June 19. Another great reminder..”we are better together” enabled to do God’s will. Blessings as you settle in to having your belongings in one place, as you and Gary live together in one place again, and as you preside over your first annual conference. Our prayers are with you!! Now this afternoon I have to make a post about love. I am listening to 5pm local news. about the DHS who can’t provide for the needs and safety of God’s children because of budget cuts. Then on Ellen a gay couple have adopted 4 children with special needs out of foster care and are not only providing for them but teaching them to give back. One of the men was a foster child who had to take his belongings in a trash bag to his foster homes and he said 40 years later, their foster kids showed up with trash bags. So they are having their kids help prepare suitcases with NEW pajamas, books etc. for them to know someone cares and they are not “trash”. Ellen sponsored through Samsonite $and suitcases to help them launch their dream of this service in every state. This is LOVE..this is Christ’s love…serving in His name. As a Methodist, I can not condemn this love!! I celebrate with you your reunion with Gary, and your ‘barn-swallow-education’! I hope your annual conference goes as well as I have been hearing ours did here in Michigan! Our journey toward wholeness is so much closer to achieving completion! I am so proud of all who have worked so hard to lead and guide us on this path! I suspect that you were involved in many large ways before you left Michigan last year… Iowa is in good hands with you as their leader! I’m so glad you looked up to the swallow’s nest and the lessons it provides, rather than concentrating (and moaning) about the debris that fell below as they built. Your messages are an inspiration. Please keep them coming.